A new report confirms some people's worst dieting fears. 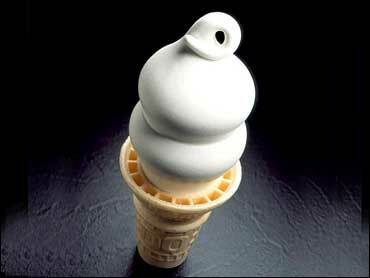 Ice cream is really fattening and high in calories. Medical correspondent Dr. Emily Senay explained on The Early Show what many already know, but have to be reminded of — too much fat is a bad thing. There are many studies that show a diet low in fat keeps people healthy, with less heart disease, fewer strokes and fewer cancers. The government says the average American should eat between 2,000 and 2,500 calories a day. That includes 20 percent to 35 percent of calories from fats, 45 percent to 65 percent from carbohydrates and 10 percent to 35 percent from protein. But, the Center for Science in the Public Interest report found that 35 percent of calories from fat can add up quickly in an ice cream parlor. The report, says Senay, reveals some shocking numbers. A regular scoop of Ben and Jerry's "Chunky Monkey Ice Cream" in a chocolate-dipped waffle cone has 820 calories and 30 grams of saturated fat. That's one and a half day's worth of saturated fat, the equivalent of a one-pound rack of baby back ribs. A Haagen-Dazs's "Mint Chip Dazzler" sundae with three scoops of ice cream, fudge, cookies, sprinkles and cream has 1,270 calories and 38 grams of fat. On a 2,000 calorie diet, one Dazzler can give you more than half the number of fat you should have in a day. Senay says ice cream lovers have choices other than abstaining from the cold creamy delight. There are lower calorie options at most ice cream parlors, and it is possible to eat even the high-fat products moderately within the guidelines. But, even these lower fat items can be dangerous, she says. The report found one 7 ounce frozen yogurt that contained seven grams of saturated fat. Saturated fat and trans fat are extremely unhealthy. Saturated fat is found in meat, poultry, whole milk, cheese, butter and, yes, ice cream. Trans fat is found in a lot of fast food and processed food. Unsaturated fats found in food like fish, vegetable, olive oils, nuts, avocados, soybeans and seed are much better for the body. Senay says if you're looking for ways to get your recommended daily intake of fats, try to eat foods that contain the fats that are beneficial. But, she says, all fats are high in calories. So, if you overeat the recommended daily intake of fat, you'll gain weight. Senay says portion control and exercise are keys to maintaining a healthy diet.